Good morning and happy Monday! I hope your week is starting out great. I'm feeling pretty organized heading into the last week of October (believe it or not! The year is flying on by :). I spent time over the weekend planning our menu. I went through the freezer and looked for things I wanted to use. It's easy for food to fall to the bottom of a chest freezer and be forgotten. I'm continuing my quest to use up leftovers and cook smaller amounts of food to avoid to many leftovers. And when I do have leftovers and we're ready for something new, I freeze those into individual servings. Those work great for my hubby to take to work or for TV dinner nights. 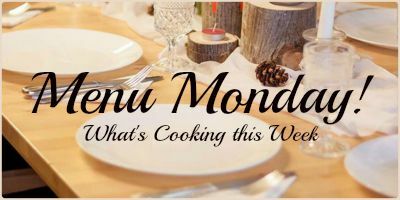 Here is what I have planned for this week..
Monday: I made potato soup yesterday and we will have that again tonight. I'll add a salad on the side and some crackers. Tuesday: Enchiladas – I'm going to make them with store bought green enchilada sauce (I actually prefer it to red). I'll serve salad and chips & salsa on the side. Wednesday: Orange chicken, pot stickers, salad – both the orange chicken and the pot stickers are from Costco. Friday: Jambalaya in my IP, salad, roasted squash. I found THIS recipe online. I'm going to give it a try and will make a couple adjustments, one being using brown rice instead of white and using some hot link sausages from Costco that I have in my freezer. I'll let you know how it is after I make it. Sunday: Spaghetti – served with french bread, salad and maybe some more roasted squash. I'm really enjoying winter squash this year.